July | 2010 | sink, bike, run. Although I’ve dabbled with a quadrathlon (but didn’t inhale), it shocked me the other day to realise that I hadn’t actually done a triathlon for two years. I’d last completed a triathlon in Plymouth, as long ago as July 2008, and then a dire lack of training (do I surprise you?) had meant that my always-struggling swim was the high point of a race that went from slow to slower. In September that year, a mechanical problem with a comedy saddle ended my Teignmouth tri, in a cold wet heap soon after the sea. 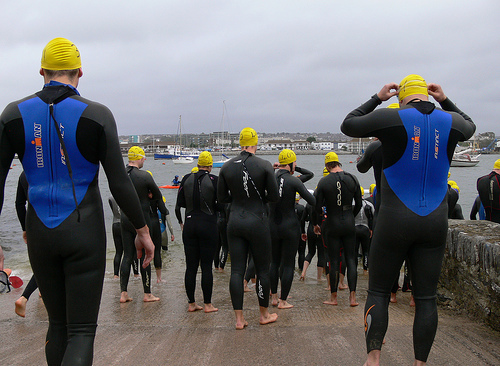 So, when I turned up at the Plymouth tri start line again this week, I was planning to exercise some ghosts. And despite those demons (or maybe because of them), I was surprisingly relaxed at the start. I happily racked my bike somewhere memorable, poured myself into my wetsuit, and splashed happily round the swim course in the bright morning sun. Now I’ve read the triathlon mags and forums (it beats training), and one piece of advice is always to remember where you put your bike, so you can find it again after the swim. Well; on all the tris I’ve done, I’ve had no problem with that. Mainly because a) I’ve left my bike somewhere prominent, even with a big flag on it, and b) mine is usually pretty much the only bike left when I’ve stopped sinking my way round the swim. Why didn’t I put my bike somewhere sensible this time, like the end of a rack? I don’t know. Why didn’t I do something sensible like at least make a mental note of where it was? Good question. The fact was, when I came out from the swim, a strange fluke meant that there were still 40 bikes left in transition. And none of the bikes seemed to be mine. No matter how many times I ran round them in small circles. I should mention at this point that I’m a bit short-sighted. So, I have some prescription goggles for swimming in. They are nowhere near as strong as my normal glasses, but they do stop me hitting piers, whales and frigates. The goggles came with a helpful sticker on the lens telling me not to use them for driving. I didn’t actually notice it for the first three times I wore them. Fortunately I walked to the pool those days, or who knows what might have happened. So back in transition, settling in for the long-haul of bike-searching, take the time to picture me, still rubber-clad in my wetsuit, bright red swimming hat, all goggled up, running round like a headless chicken on fetish night. It was then that I lost my presence of mind. I ran up the racks, I ran down the racks. I ran in circles and squares. I ducked underneath the racking, I climbed over it. I wondered about sitting down and having a good cry. I wondered if someone had stolen my bike. And my shoes. And my jelly babies. And the big blue box that was meant to make finding things so easy. The thing was, I could remember exactly where my bike was. Yes, right next to some other bikes. And all the time I was searching, blinded by the endless reappearance of bikes I’d already seen, I was deafened by the relentless ticking of the bloody clock as I beat the record for slowest transition ever. He asked me what my bike looked like. I resisted the temptation to say a wheel at each end, and we finally, finally, found it (mainly I think because all the other bikes had gone by now, and they wanted to pack things away). Reunited with my bike, staggering out of transition, a straitlaced marshal paused me to insist that I did my top up properly. Even semi-bare chests apparently lower the tone of triathlon, though nowhere near as much as sweary blind forgetful people, I reckon. And that would have been just the incompetent interlude in my story of triumph over triathlon demons, except that 8 miles into the bike route my back wheel disintegrated into an unhappy clash of broken spokes, bendy rim and bad language (do you see a theme emerging?). Limping home, emotionally scarred but not scared, I will be back for my unfinished business. While I didn’t beat the demons this time, they didn’t win either. Nil – nil, and we’ll fight it out in many years of extra time. Anyway, I think that, like matter, demons are neither created nor destroyed. Jump on one end of the bouncy castle, and the other end bounces back. And demons can be a useful voice in the ear to spur you on (and me on), higher, faster, stronger. Just so long as the demons remember that I’m in charge, not them.